The Nikon D5100 ships in kit form with the same AF-S DX NIKKOR 18-55mm f/3.5-5.6G VR lens that's included in D3000, D3100, and D5000 kits. To better compete with models from brands such as Olympus, Pentax and Sony that have in-body image-stabilization, this kit lens comes with Nikon's excellent Vibration Reduction (VR) technology to help compensate for camera shake. We tested a sample of the AF-S DX NIKKOR 18-55mm f/3.5-5.6G VR on SLRgear.com. Optical performance is so-so wide open, but the lens is capable of very good sharpness if stopped down one or two f-stops, and the added image stabilization should come in handy in low-light situations. While sharpness wide-open is only average, this newer kit lens performs better overall than the original, non-VR 18-55mm, and is enormously better when it comes to flare: The previous version was subject to rather extreme veiling flare when shooting high-contrast subjects under bright conditions. Kit lenses work well enough for most consumers, and serve their purpose, getting you started without breaking the bank; but a big part of the attraction with SLRs is that you can easily trade up to a better lens when your finances improve, and extend your reach to wider angle, telephoto, or macro photography just by adding to your lens collection. The 18-55mm VR lens that comes with the Nikon D5100 will do a fine job until such time as budget and desire lead you to start building a lens collection. Like the Nikon D40, D40x, D60, D3000, D3100, and D5000 before it, the Nikon D5100 drops autofocus support for the older AF lenses whose focus mechanisms were driven from the camera. These lenses have what looks like a little screwdriver slot on their mounting flange that couples with a protruding, screwdriver-looking shaft on the camera body. A motor in the camera body is thus required to drive the lens mechanics to adjust focus. The tables below (courtesy Nikon Inc.) tell the full story of lens compatibility for the Nikon D5100. The Nikon D5100 includes the company's Automatic Distortion Control function, an interesting feature that was introduced in its predecessor. Enabled via the Shooting menu, this option automatically corrects for barrel and pincushion distortion in JPEG files, and works with most of the company's Nikkor D- and G-type lenses, except for PC, Fisheye and certain other lenses. We found that Automatic Distortion Control worked very well with the Nikkor 18-55mm VR lens, in our testing of the earlier D5000 model. The Nikon D5100 also offers distortion correction as a post-processing function, available from the Retouch menu. The playback-mode function allows you to create a copy of an image after applying either an automatic correction with manual fine-tuning, or a manual correction with a coarser-grained adjustment whose effect is previewed on the camera's LCD display. The Nikon D5100 shares the same Multi-CAM 1000 phase-detection autofocus sensor module that's previously appeared in the D3000, D3100, and D5000, among others. 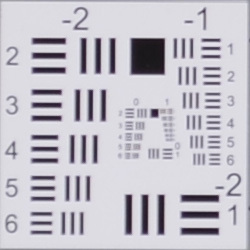 The Multi-CAM 1000 module offers 11 focusing points, of which the center point is a cross-type sensor. As in the D5000, the approximate AF point locations are indicated with faint black markings, illuminated by single red LEDs. The LED indications, albeit very small, are bright and easy to see, and thankfully none of them "bleed" into other points, an issue we'd previously seen with the D3100. Single-servo AF is best for stationary objects, as the camera sets focus only once when the Shutter button is first pressed halfway (or if the AF-ON function is set, when the AE-L / AF-L button is pressed). Continuous-servo AF and the Live View / movie Full-time servo AF both mean that the camera continuously adjusts the focus, as long as the Shutter button is halfway pressed, suitable for moving objects. In Auto-servo AF mode, the camera begins focus operations in Single-servo mode, but switches to Continuous-servo AF if it detects motion within the active AF area. Like higher-end Nikon SLRs, there's an important difference between Single and Continuous Servo modes: In Single-servo mode, the shutter won't release unless the lens is focused, or the lens itself is set to manual focus -- what's known as Focus Priority. In Continuous-servo mode however, you can choose between Focus or Release Priority. In the latter, the shutter will fire regardless of the state of focus. The AF-Area Mode option in the information display (see right) lets you select between Single-point, Dynamic Area, Auto Area AF and 3D Tracking modes. Single Area AF simply means that the camera judges focus based on one part of the subject, and the user can manually select the AF point by pressing the arrow keys. Dynamic Area AF employs all of the autofocus points, though you can still manually select the main point. When Dynamic Area focusing is enabled, the camera first focuses on the subject in the selected focus area. When the subject moves to a different AF area, the camera shifts the focus to "follow" the subject. This is great for irregularly moving subjects. (Sports and kids come to mind.) The Auto Area AF option means that the camera automatically detects the subject and selects the focus point(s). The 3D Tracking mode uses the 420-element RGB exposure/white balance sensor to aid in subject tracking. In Live View mode, the Nikon D5100 offers only contrast-detection autofocus (some older Nikon SLRs give you a choice between phase-detection and contrast-detection in Live View, but not the D5100). There are three focus modes in Live View: Single-servo AF (AF-S), Full-time servo AF (AF-F) and Manual focus (MF). Of note is AF-F mode which is similar to AF-C mode when using the optical viewfinder (though you don't have to half-press the shutter button), which offers continuous full-time autofocus in Live View and Movie modes. There are four AF-area modes in Live View mode: Face-priority AF, Wide-area AF, Normal-area AF and Subject-tracking AF. Face-priority is useful for portraits. Up to 35 faces can be detected and when more than one face is present, the D5100 will select the closest one. You can also manually select which face to focus on using the multi-selector. Wide-area is recommended for landscapes and other non-portrait shots. Normal-area offers a smaller focusing area, and is useful for focusing on a small area of the frame. With either Wide- or Normal-area, you can move the active focus area with the multi-selector. Using a tripod is recommended. 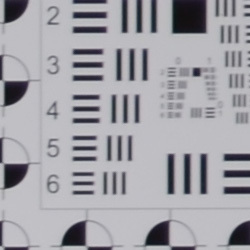 Subject-tracking attempts to track a selected subject as it moves through the frame. You position the focus point over your intended subject and press the OK button to begin tracking. To end tracking, press the OK button again. Note that Subject-tracking AF may be unable to track a subject if it's too small, moves too quickly, is similar in color to the background, changes sizes, or if the subject and background are very bright or dark, etc. Like past Nikon DSLRs with built-in flashes, the D5100's AF-assist light is a bright incandescent bulb that emits from the body near the handgrip. We thought to call particular attention to it, because some DSLRs use the flash as an AF-assist light. That would be fine, were it not for the fact that some such cameras also require that the flash be used in the exposure, so there's no way to have AF assist for available-light shots. The Nikon D5100 doesn't have this limitation. AF assist is however not available in Live View mode. The Nikon D5100 includes a two-pronged approach to fighting dust. The dust reduction system previously seen on the D3000, D3100, and D5000 digital SLRs has been adopted for the D5100, where the optical low pass filter over the sensor is vibrated to shake off dust. In addition, Nikon has coupled this with what it is calling the "Airflow Control System". In essence, the camera's internals have been designed so as to control the flow of air -- along with the dust the air is carrying -- when the shutter is triggered, channelling dust particles away from the sensor. The Nikon D5100 lets you choose when the sensor is ultrasonically cleaned. Selections available in the Setup Menu are Clean at Startup, Clean at Shutdown, Clean at Startup & Shutdown, or Cleaning Off. You can also lock-up the mirror for manual cleaning (see below). It's important to check that you have sufficient power available while cleaning the sensor though. When the camera is switched off or the power runs out, the mirror and shutter will return to their normal positions- potentially causing damage if there's something blocking their path. Helpfully, the Nikon D5100 will attempt to give a warning roughly two minutes before the power runs out, by flashing the self-timer lamp and emitting a beeping sound -- a good warning to get your cleaning supplies out of the camera pronto! Despite the new dust cleaning features, we haven't seen an automatic system yet that's capable of removing all dust. So while this is a nice feature to have, don't be fooled into thinking that you won't have to either learn how to clean your sensor or send the camera in for cleaning. Everyone understands that lenses sometimes get dust on them and need to be cleaned, and there are a lot of lens-cleaning cloths, solutions and other accessories on the market that work well. BUT, what do you do when your sensor gets dusty? Dust specks on the sensor tend to show up when shooting at very small apertures, appearing as dark blobs on your images. They're distracting at best, a terrible nuisance at worst, if you end up having to retouch every image to rid of them. Most of us are naturally leery about the idea of poking around inside the delicate innards of our DSLRs to wrestle with recalcitrant dust specks. Gently blowing the sensor surface (actually, the surface of the anti-aliasing filter) with compressed air gets rid of some dust, but there's invariably a lot that just stays stuck, no matter what. So what do you do? If you've got dust specks on your sensor (and sooner or later you will), you're going to need to clean it. There are a lot of products out there intended to address this need, but a distressing number of them work poorly (if at all), and many are grossly overpriced. Advertising hype is rampant, with bogus pseudo-scientific jargon and absurd product claims run rampant. And prices -- Did I mention prices? How about $100 for a simple synthetic-bristle brush? So how do you know what product to use? We don't pretend to have used everything currently on the market, but can tell you about one solution that worked very well for us. The "Copper Hill" cleaning method is straightforward and safe, and in our routine usage here at Imaging Resource, highly effective. Better yet, the products sold by Copper Hill Imaging are very reasonably priced. Best of all, Nicholas R (proprietor of Copper Hill) has put together an amazingly detailed tutorial on sensor cleaning, free for all. Sensor cleaning is one of the last things people think about when buying a d-SLR, but it's vital to capturing the best possible images. Take our advice and order a cleaning kit from Copper Hill right along with your d-SLR, so you'll have it close at hand when you need it: You'll be glad you did! Average performance from the 18-55mm VR kit lens. The Nikon D5100 is available bundled with a Nikkor AF-S DX 18-55mm f/3.5-5.6G VR lens, which has a typical zoom ratio for an SLR kit lens of about 3x giving a 35mm equivalent zoom range of about 27-83mm. Sharpness is good for a kit lens across most of the frame at full wide-angle with some minor blurring in extreme corners at f/8, though images are a touch soft overall. There are low levels of coma distortion in the leaves at the corners and chromatic aberration isn't much an issue because most of it is removed by the D5100's image processor, though some fringing is still visible in the leaves at top-left. Results at full telephoto are also good, with good detail across much of the frame, very low chromatic aberration, but some corner softness is still noticeable at f/8. 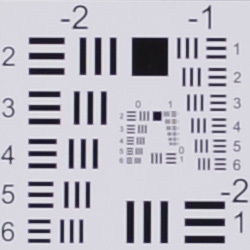 (See below for how the lens performs at maximum aperture.) Overall, not a bad performance for an inexpensive kit lens, thought the D5100's 16-megapixel resolution is starting to show the lens' limitations a bit more than its lower resolution predecessors, at least when viewed on screen at 100%. Note that this lens has built-in Vibration Reduction (Nikon's term for optical image stabilization), which should be very useful for hand-held shots in low light. 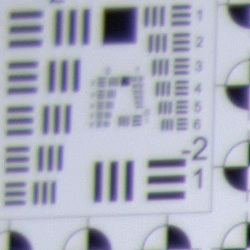 A slightly larger-than-average macro area for an SLR kit lens, with slightly soft detail overall. Flash throttles down pretty well. The Nikon D5100 captured a slightly larger-than-average macro area with the standard 18-55mm VR kit lens, measuring 3.02 x 2.00 inches (77 x 51 millimeters). Detail was good but a touch soft, and there was some minor additional softening in the corners despite being stopped down to f/8. (Most lenses have some softening in the corners at macro distances.) The Nikon D5100's flash throttled down well at minimum distance, resulting in a well exposed image with fairly even coverage, though color balance was somewhat cool. High barrel distortion at wide-angle with the 18-55mm VR kit lens, though very low distortion at telephoto. The Nikon D5100's 18-55mm VR kit lens produced about one percent barrel distortion at wide-angle, which is higher than average and noticeable in its images. At the telephoto end, there was less than 0.1% of pincushion distortion, which is lower than average and hardly noticeable. This is the tendency for the lens to bend straight lines outward (like a barrel -- usually at wide-angle) or inward (like a pincushion -- usually at telephoto). Low geometric distortion when Auto Distortion Control is enabled. The Nikon D5100 offers an Auto Distortion Control feature to reduce geometric distortion automatically for supported lenses. As you can see it worked quite well with the 18-55mm kit lens, reducing barrel distortion at wide-angle significantly, but it overcorrected the pincushion distortion at full telephoto ever so slightly. Since this option is database driven, it's only available for Nikkor D and G-type lenses with certain optics such as Fisheye and Perspective Control lenses excepted. Auto Distortion Control is Off by default, and you can apply Auto or Manual Distortion Control to JPEGs after the fact, in the Retouch menu. Manual mode works with images from any lens. Low Chromatic Aberration in JPEGs, higher in uncorrected RAW files. Some blurring in the corners of the frame at wide-angle and telephoto with the kit lens wide-open. Higher levels of Chromatic Aberration in RAW files. As you can see from the crops above, levels of chromatic aberration are higher in uncorrected RAW files at wide-angle. CA at full telephoto however is quite low in RAW files. Nikon has automatically been reducing CA in its DSLR JPEGs for a while now and it's nice to see that continue with D5100. Unlike Auto Distortion Control, Nikon's CA reduction works with any lens including third-party lenses, and can't be disabled. The images above were taken from our standardized test shots. 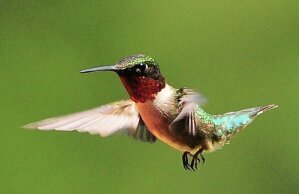 For a collection of more pictorial photos, see our Nikon D5100 Photo Gallery .